Sharks have a serious PR problem. Starting with Steven Spielberg’s movie Jaws, the admonition ‘don’t go in the water’ became a matter of common sense for many people. Threatening background music used in shark documentaries and media coverage focusing on negative events, such as attacks on surfers, helped build the unfavorable image of sharks. After years of being depicted as vicious man-eaters one would be hard pressed to find another marine animal that is more feared than the shark. And shark populations are dropping sharply. 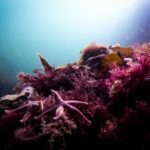 Humans have taken over their spot as the top predator in the ocean food chain, and sloppy fishing techniques, lack of regulations, culls, and an appetite for shark fins have all thinned out their ranks. Their poor public image is not helping. When a top predator disappears from an ecosystem and is not replaced, it can have cascading effects throughout the food web. Declining shark populations can lead to the disappearance of other species of fish lower down on the food chain, as mesopredator populations—smaller sharks, rays and other marine mammals—increase because of the reduced risk of predation from apex predators (large sharks). This upsets the balance and reduces the biodiversity of ecosystems. 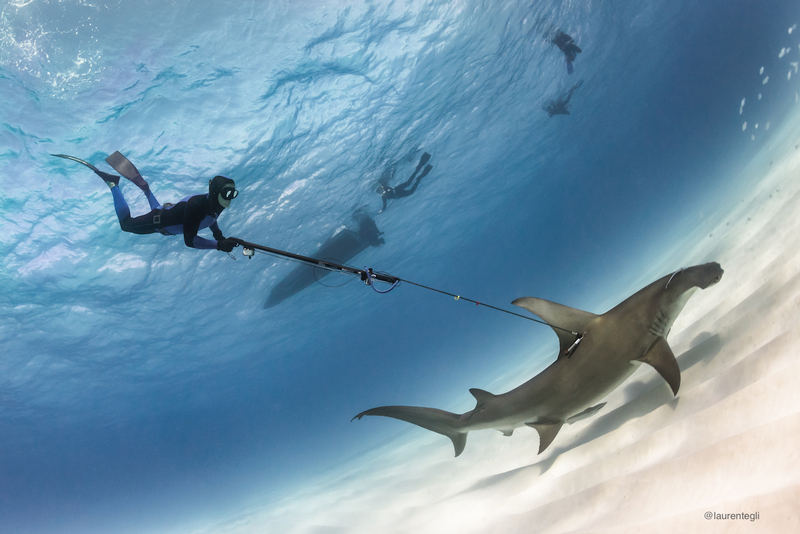 William Winram, a world-class freediver and shark conservationist, contends that the vilification of sharks makes people less motivated to protect them. His own first encounter came over 25 years ago when he was spearfishing in Mexico. Out to catch his dinner, Winram had just speared a fish when he sensed something behind his right shoulder. When he turned around, he was face-to-face with a tiger shark—4 meters (13 feet) in length and over 500 kilograms (1100 pounds). Armed with a natural human instinct and years of indoctrination telling him to fear sharks, Winram was petrified. “Had my heart been capable of exiting my chest and heading back to the beach, it would have,” he recalled in a TEDx Talk. But the shark did not attack him. Instead, it swam off after Winram lunged to pick up the pole spear he had dropped in a panic. Like a curious cat, the shark followed Winram on his swim back to the beach, all the time keeping a safe distance for fear of being attacked. Though at the time Winram was unaware of this behavior, he had an inkling that the shark might be afraid of him. To test out this theory, he dropped his gear and swam aggressively at the animal, which flinched and swam away. He never saw the shark again. That the shark did not display any aggressive behavior completely fractured the false perception of sharks that Winram had inherited through books and movies like Jaws. “It showed that sharks are not psychotic killing machines,” he says, “but instead are shy, cautious and curious predators.” It was a formative experience that influenced him to learn more about sharks. He quickly began to study them, devouring books and articles on microfilm. When he could not find any mention of someone having a similar experience to his, his interest was piqued. Over the next 25 years he would have numerous shark interactions and would develop an advanced understanding of these complex creatures. In 2008, Winram volunteered his breath-hold skills on an expedition to the island of Malpelo, where there is a 40-kilometer (25-mile) marine protected area. On that expedition, Winram and other divers tagged 47 scalloped hammerhead sharks. The resulting research proved conclusively that the sharks spotted in the protected area were the same sharks that visited the Galapagos and Cocos Islands at other times of the year. These sharks were migrating outside of the marine protected area. 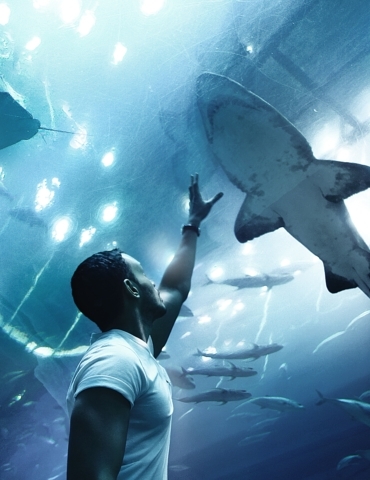 Four years later, after receiving a funding offer from a foundation in Geneva, Switzerland where he is based, Winram founded The Watermen Project, a non-profit organization dedicated to ocean conservation with a focus on sharks and other big pelagic fish. 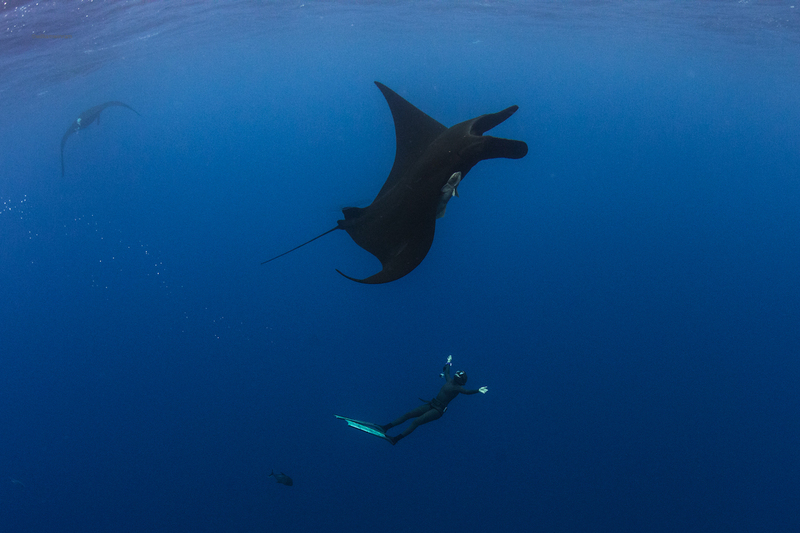 Members of the organization actively contribute their breath-hold skills to scientific research by tagging sharks to track their migratory patterns and take biopsy samples or photographs of other animals such as manta rays. The Watermen Project has conducted numerous tagging expeditions since its inception, in such shark-prone areas as South Africa and Isla Guadalupe, and most recently in the Revillagigedo Islands and Bimini, Bahamas. They mitigate the dangers associated with diving with sharks through knowledge of shark behavior and extensive training. To this goal, The Watermen now seek to bridge the gap between science and laypeople by raising awareness of conservation issues using modern tools such as video and social media. 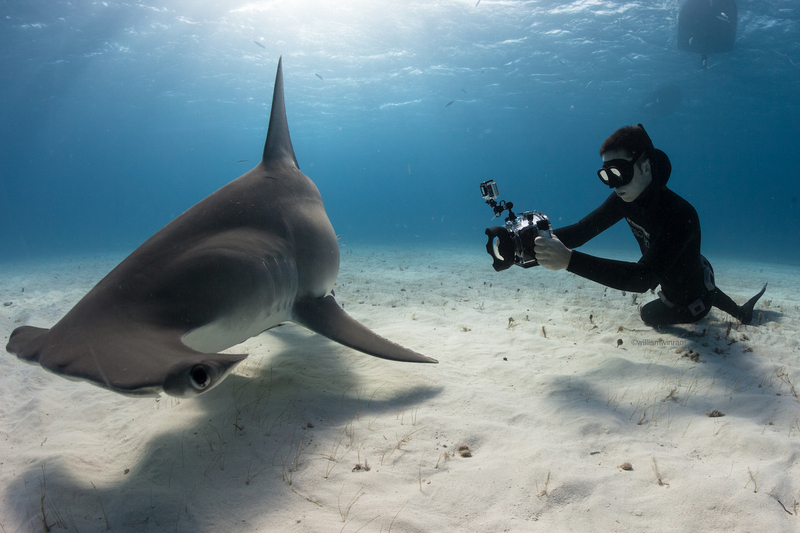 Today, on expeditions, another objective in addition to tagging sharks is to take photos and videos of divers diving with sharks and sharing them to engage the public. Winram also engages in public talks, including this TEDx Talk, to try to offer his unique perspective on sharks. The Watermen Project also engages in training the next generation of freediving conservationists through its Young Ambassador program, which was created to provide mentoring and instruction to young scientists interested in using freediving to contribute to ocean conservation and scientific research. Winram is helping the Young Ambassadors develop their freediving skills, teaching them how to tag sharks and mantas, and how to photograph, film and use social media for engagement with the public on conservation issues. The Watermen’s philosophy towards conservation is summed up by the idea that we only conserve what we love, and we only love what we are taught to understand. Until now, sharks have been terribly misunderstood, because of what we have been taught about them. While they do not expect everyone to love sharks, they want people to understand the vital role they play in maintaining the health and survival of life in the oceans. Only when people understand their importance will they be motivated to protect them. 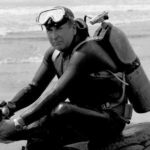 PrevWho Was Envelope Pushing Diver James Stewart?